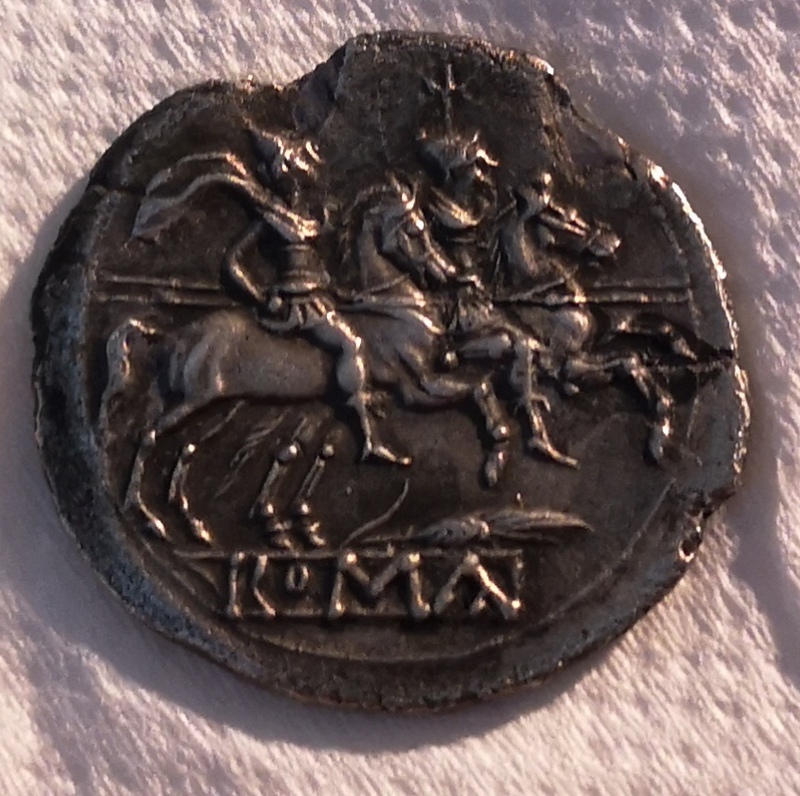 The republican denarius I bought last week arrived and is really something in hand. However, a previous owner has had a go at removing some of the black encrustation (see the picture below), leaving a few minor scratches which are evident when the coin is in hand. As there was already some minimal damage on that side of the coin, I thought it wouldnt hurt to try some experimental remedies. The first method I tried was simply to pick the black spots off with a toothpick, but they were stuck fast. I decided to try the Thiosulphate treatment mentioned in the last thread. I placed some Sodium Thiosulphate into a beaker and dissolved it in room temperature deionised water. I then placed the coin into the mixture. The coin immediately began to turn black (which I expected, but was a little nerve wracking to watch - see picture below). However, large areas of the coin - including those that had previously been black - turned a beige colour. After some time in the mixture, I removed the coin and patted it dry. The spots on the reverse were then easily removed with a toothpick. Interestingly, the obverse, which I had assumed was a total write-off, was substantially beige. It was clear that a lot of the obverse was covered in this odd encrustation, so I continued with soaking and picking. No more encrustation could be seen on the reverse after a few cycles, so I decided to prevent any further potential damage by applying the thiosulphate to the obverse only using a cotton swab. The 'horn silver' encrustation was simple to remove, but as the obverse was very encrusted, it took perhaps 20 cycles to remove it. This revealed a different kind of deposit, which I began to remove using carefully applied lemon juice and a steel pin between each thiosulphate cycle. This was quite successful and many previously hidden features were revealed, but it came to a point where removing the encrustation was simply revealing a badly corroded surface, so I eventually stopped. 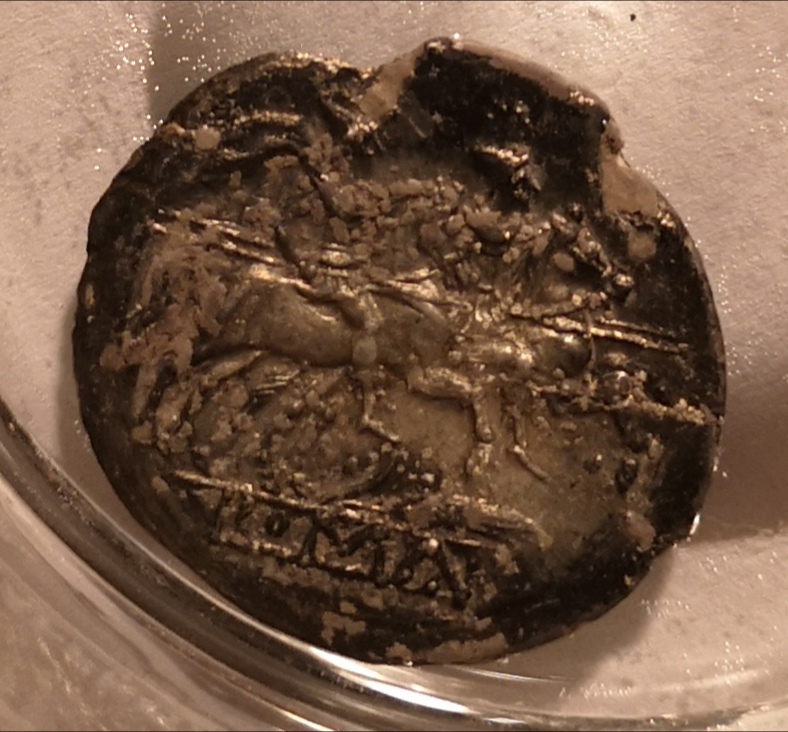 The coin had been turned black by the thiosulphate treatment, so I used an old silver cleaning trick (sodium bicarbonate and aluminium foil) to lighten it up. I stopped this when the coin was an almost natural grey tone and then used a cotton swab soaked in lemon juice to highlight the features (though I may restore it to 'blast white'). The coin was then washed in sodium bicarbonate to remove any residual acid, then rinsed multiple times in fresh distilled water and dried. The reverse cleaning was very successful. All of the black spots were removed with no further damage to the coin, though the toning process did somewhat highlight the damage that was already present. The reverse is spectacular - the individual hairs on the horses' manes are easily distinguished. A small pit is evident on the corn ear where the worst of the encrustation lay, though this may have been on the die. 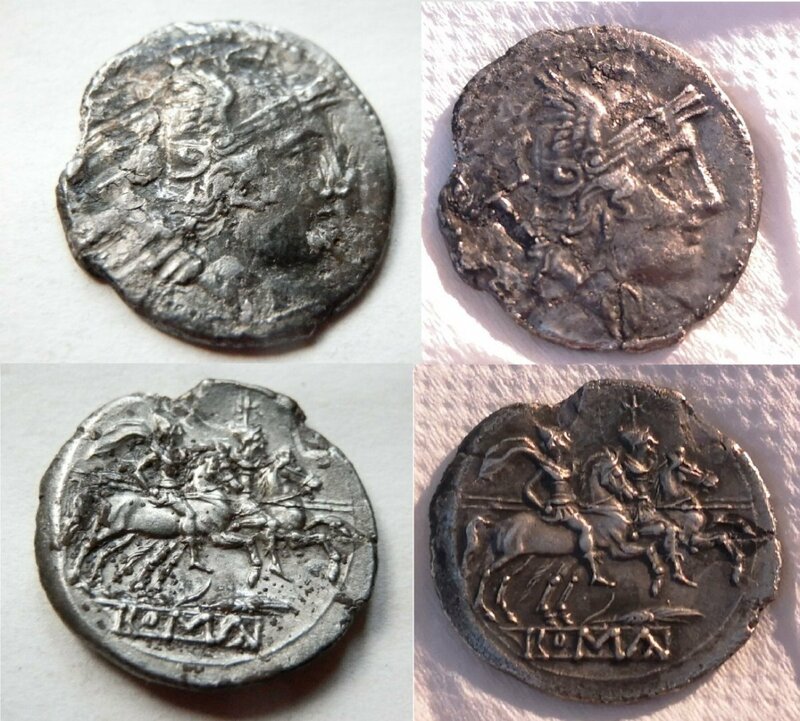 The obverse cleaning, while much more successful than I expected, did not produce such results. 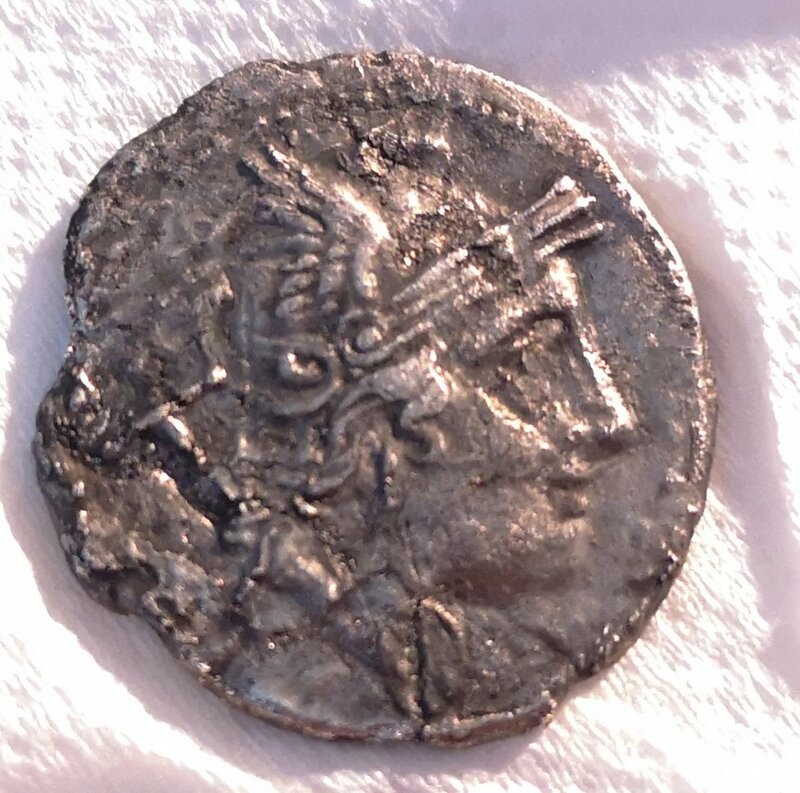 The 'X' denomination mark, almost totally hidden by corrosion before, was revealed, and the bust of Roma is nearly fully defined. However, the encrustation had damaged the underlying surfaces and in a couple of areas I did clean further than I think would have been advisable. I'm quite glad the obverse didnt magically turn out to be mint state, or I'd probably have to sell it. With the obverse so badly damaged, I have a good excuse to keep it. Wow. Sounds like it was quite a ride with fantastic results. Congratulations! Nice job! Took the liberty of a before and after hope you don't mind.. Does show just how much more detail was revealed on the obverse as well as the reverse ..
Wow, nice job. I'm going to copy and paste that info - thanks for sharing. BTW - the obverse looks better than before. The reverse shows really impressive results, but the obverse has also improved wonderfully and Roma´s face looks much cleaner. Congratulations on a great job!